You can access on-board memory locations from MATLAB, using the MATLAB AXI master IP in your FPGA design, and the aximaster object. The object connects to the IP over a physical cable, and allows read and write commands to slave memory locations from the MATLAB command line. To use this feature, you must download a hardware support package for your FPGA board. See Download FPGA Board Support Package. To access on-board memory locations from MATLAB®, you must include the MATLAB AXI master IP in your FPGA design. This IP connects to slave memory locations on the board. The IP also responds to read and write commands from the MATLAB command line, over JTAG, PCI Express, or Ethernet cable. Include the MATLAB AXI master IP in your FPGA design. To add the path for the IP files to your project, call the setupAXIMasterForVivado or setupAXIMasterForQuartus functions. In your FPGA project, specify which addresses the AXI master IP is allowed to access. 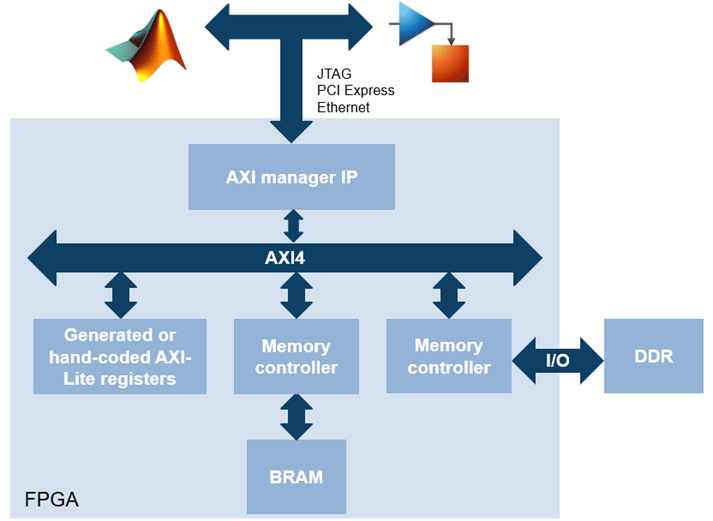 The AXI master IP supports AXI4 Lite, AXI4, and Altera® Avalon slave memory locations. The FPGA interconnect automatically converts AXI4 transactions to the protocol of each address. Compile your FPGA project, including the MATLAB AXI master IP. Connect your FPGA board to your host computer using a physical cable (JTAG, PCI Express, or Ethernet cable). Program the FPGA with your compiled design. Alternatively, you can perform these steps in the HDL Coder™ guided workflow by using a sample reference design, such as the one included in these examples: (HDL Coder) or (HDL Coder). Once the program is running on your FPGA board, you can create a MATLAB AXI master object, aximaster. To access the slave memory locations on the board, use the readmemory and writememory methods of this object. When using JTAG as a physical connection to your board, you might have additional IPs that use the same JTAG connection. Such IPs include FPGA data capture, Altera SignalTap II, or Xilinx® Vivado® Logic Analyzer cores. The MATLAB AXI master IP can coexist in your design with other IPs that use the JTAG connection, however, only one of these applications can use the JTAG cable at a time. Release the aximaster object to return the JTAG resource for use by other applications. The most common conflicting use of the JTAG cable is to reprogram the FPGA. Stop any FPGA data capture or MATLAB AXI master JTAG connection before you can use the cable to program the FPGA. The maximum data rate between host computer and FPGA is limited by the JTAG clock frequency. For Altera boards, the JTAG clock frequency is 12 MHz. or 24 MHz. For Xilinx boards, the JTAG clock frequency is 33 MHz. or 66 MHz. The JTAG frequency depends on the type of cable and the maximum clock frequency supported by the FPGA board.